A research paper published by the Nature Conservancy is warning of expanded reliance renewable energy leading to a new phenomenon called “green sprawl”. While not critical of renewable energy development the paper’s authors point out that there is another side of the coin to consider as these less efficient means of producing energy resources requires devoting more physical space to accomplish it in. The stated shift in U.S. energy policies, and the pending Waxman-Markey cap-and-trade bill, will require changes in regulatory regimes for land use, and will also likely accompany a shift in power from state and local regulatory agencies to the Federal level. This is inevitable as the reliance on domestically produced renewable energy will demand Federal government oversight at the expense of states rights. Another policy consequence of renewable energy development is going to be agriculture policy as it is unlikely that corn and soybean lobbies will back off political pressure to develop ethanol and biodiesel mandates as part of our evolving energy policy. With a finite amount of sustainable farm land and the economics of fuel crops over food crops will pull farm land away from food production to fuel production, leading to greater frequency and amplitude of price swings in the commodity markets. The impact on agriculture policy is particularly interesting to consider when the substantial economic subsidies provided by the Federal government to farmers are taken into account. Will the shift from food crops to fuel crops drive Congress to pump more taxpayer dollars to farmers as an incentive for maintaining food crop production for domestic use and for export? Not only is this plausible, it’s entirely likely as a reduction in food exports would drive up the trade deficit, because the stated goal of domestic renewable energy production is to fuel domestic use. 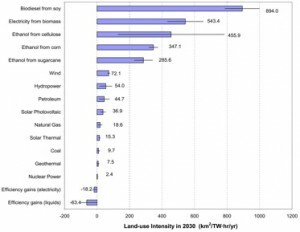 This study points out what is widely known, ethanol, biodiesel, and burning of biomass for electricity are the most intense land users of all the available options. Essentially the problem is that if energy crop production occurs in land previously devoted to food crops, the resulting distortion of global commodity markets may drive less efficient agricultural expansion in far away places. Habitat and wildlife disruption is also a consideration here as this report points out that the clearing of land represents only 3-5% of the total disruption imposed by wind turbine farms, with 95-97% of the disruption to wildlife occurring from habitat disruption, pattern avoidance and bird mortality from continuing operation of these turbine farms. A perfect example of the tension that exists between renewable energy construction and environmental advocates is the recent bill proposed by Senator Feinstein that would create two national monuments in California’s Mojave Desert, which would have the effect of stopping development of 13 large solar and wind turbine projects currently under development. I ask you, if we can’t put a solar farm in the middle of the desert where can we put it? This habitat disruption is not limited to wildlife either, here in California a landmark bill was signed into law that requires utilities to buy excess electricity generated by solar arrays installed on homes. It is projected that this law will generate a 3x expansion of solar in California. Consider the implication of a dramatic expansion of solar arrays that reflect sunlight as much as consume it. Homeowners in the many hills of the Bay Area and Southern California could be faced with blinding reflected light as a result. In all major urban areas planning commissions require homeowners and commercial developers to take into account the immediate environmental impacts of their construction, which means that if my downhill neighbor want to a put a bleached white roof and a massive solar array on his roof and the result is a sustained intense glare reflected into my house, there is a process by which I can object and slow down the project with the strong potential for ultimately stopping it. The report authors were diligent in pointing out that in any of the scenarios they studied, the actual increase in energy requirements by 2030 could be significantly mitigated by conservation measures. Related to that, improvements in efficiency of the full range of renewable energy solutions will also bring improvements. Under every scenario the Nature Conservancy report considered the land use requirements were eye popping with at least 79.5 thousand square miles of area required by 2030, an area slightly larger than the entire state of Nebraska. Taking into account the transmission grid and supply chain contingencies for committing this large of an area, it is unconceivable that we would develop it as a single or even regional dense energy zone. What is more likely is that energy production would be broadly distributed in areas not accustomed to having these resources located close by. As the U.S. moves to energy policy that emphasizes renewable energy development, we would be wise to consider the impacts on land use and agriculture policy as well as recognize that the relationship between state and federal governments cannot and should not be trampled in process. Sen. Feinstein’s bill to create Mojave Desert monuments ruins the prospect of subtle, non-invasive solar projects on federal lands. Solar farms could easily and inoffensively be placed on these lands without affecting native species. If you’re interested in solar energy or any other alternative energies, check out http://www.greencollareconomy.com. It has hundreds of case studies on emerging green technology and solar power. It’s also the largest b2b green directory on the web.